Complete Vegetable and Fruit Carving Course - WOW your Friends! Certificate of completion is available to students who send photos of all the completed projects in the course. Certificate is suitable for framing with embossed gold seal. There is no expiration date for your online lessons. P.S. Ooohs and Aaaahs are guaranteed. If you are not absolutely thrilled with the clarity of my lessons and the responses that you get from your friends family and guests, I will refund your money in full. That’s right, you’ve got no risk at all. 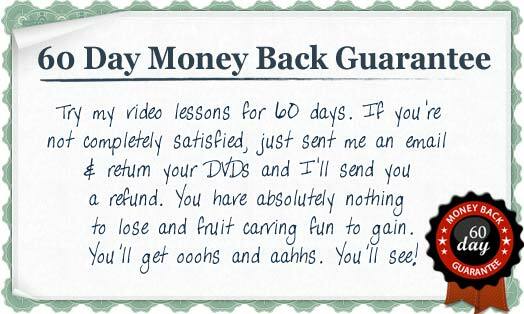 If you don’t like my course, cancel within a 60 days and I will refund you. impressive garnishes and centerpieces in no time. If you would rather not watch the video, you can read below for info all about the course. Would You Like Memorable Ways to Impress your Guests? 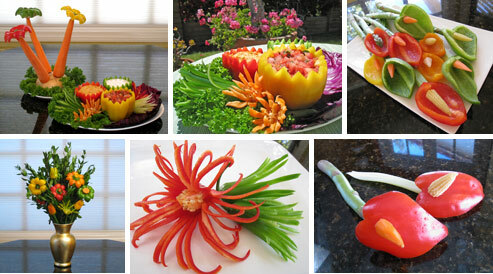 Are You Searching For Quality Step-by-Step Lessons for create stunning vegetable and fruit carvings? Frustrated Wasting Money On Lousy Tools, and Books with hard to understand instructions? Want A Short Cut Way to Learn How The Masters Do It… without Lots of Trial and Failure? With this detailed, 11 week, step-by-step, video Vegetable and Fruit Carving Course, YOU CAN create beautiful fruit and vegetable carving centerpieces and garnishes with ease. 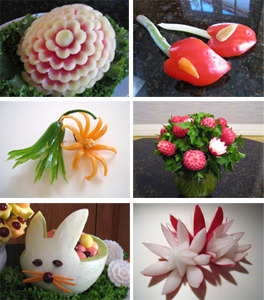 You will be thrilled to learn how fast and easily you can create amazing vegetable and fruit carvings. In this Vegetable and Fruit Carving Course you will Learn Secrets that professional vegetable and fruit carving experts have used for years. Learn How to Avoid the Most Common and Costly Mistakes made by Beginning Fruit Carvers that make the difference between Success and Failure. Step by step fruit carving instructions show you exactly how to create memorable garnishes and spectacular centerpieces more easily than you dreamed possible. Detailed Video Instructions that show action details that books with photos and words cannot communicate. We begin with simple elegant vegetable and fruit carvings that you can make in minutes with tools that you already own and then progress from there. Your new skills will continue to improve and all of the 11 weeks of projects in the lessons will seem easy. You will learn about the most important “must have” vegetable and fruit carving tools that will give you the best results with the least effort. How to select the best vegetables and fruits for the best carving results. You’ll also learn fast and fun carvings that will have your children happily eating more healthy fruits and vegetables. The Vegetable and Fruit Carving 101 video instructions are even better than taking a live class because you can refer to them time and time again at your convenience in the comfort of your own kitchen. “I LOVE the way you teach, you take your time explaining the RIGHT and the WRONG way of doing every step and the DOS and DON’T of every step”. I have an easy, effective way for you to successfully learn the art of fruit carving. It is my Vegetable and Fruit Carving 101 Course. I will be showing you exactly what is covered in the course which is divided into 11 sets of lessons. I designed the course with 11 weeks of lessons. But you can learn as fast or as slowly as you like, at your own pace, and at your convenience. Whether you prefer to learn in the quiet of the middle of the night, in the early morning hours, or the middle of the day, you can. It’s your choice. With my video course, you will WOW your family, friends and clients by transforming common fruits and vegetables into impressive works of art. When you start making the fruit and vegetable carvings in my course you will be hearing comments like these. You will definitely get Ooohs and Aaaaahs. You’ll get the creative satisfaction of turning common fruit and vegetables into beautiful garnishes, bouquets, side dishes and centerpieces that you will be proud to display. Once you know some of the basics there is no end to what you can create. Your guests will certainly be impressed when they come for dinner or a party and are greeting by your lovely carvings. And, you’ll be the talk of your community when your guests tell their friends. It’s happened to me time and time again even when I was just beginning and I know it will happen for you, too. You’ll be surprised at how easy it is once you know how. You’ll make your loved ones feel special when your make carvings for them. And, if you have children in your life, you may even find them happily eating more fruits and vegetables. Because I know that Vegetable and Fruit carving Classes can be really hard to find, my intention is to offer you an online video course that comes as close to being a live class as possible. In some ways, it’s better because you always have a front row seat, and you can replay any lesson over at any time. You can learn at your own pace, on your own schedule in the comfort of your own kitchen. I want to save you the time and money that I wasted during my process of learning vegetable and fruit carving by trial and error. I wasted money on so many books that were not as helpful as I thought they would be. Some turned out to have silly projects that were just too childish. Some had great carvings but required tools that I could not find anywhere. Some had lovely carvings but the photos and words didn’t really communicate exactly how to make them. So, many of the lessons ended up being incomprehensible to me. If you’re like me, you’ll learn best by being shown how. So, in my video lessons, I show you and explain, step-by-step how to carve and get great results on your first try. “I like the way in instruct and then give us time to carve. You give good details and seeing up close helps. I start with easy projects that you can start making right away without special tools and with ingredients that you probably already have at home. My video lessons are structured to build your skills lesson by lesson while giving you the satisfaction of beautiful carvings right away. It’s way more fun to have ‘instant gratification’ than to be frustrated by jumping into lessons that are too advanced and then getting discouraged. In addition to learning how to carve, I also show you common mistakes, how to avoid them, and how to fix or camouflage them. You will learn how to store your carvings so that they look fresh when you display them. And, you will learn how long you can expect your carvings to last. While learning step by step, each step of the way will seem easy. And boy am I impressed.. Along the way, you will learn how to use the most versatile and useful fruit carving knives and tools. I’ll recommend the ones that I like the best. And, because these knives and tools are difficult if not impossible to find in stores, I make it easy for you by offering them on my website. For other tools that you can find easily, I’ll make suggestions as to where to get them. So, what’s in the lessons? I’ll show you so that you’ll know if this is for you. We start with carving onion lotus flowers . You’ll learn to make several variations, with several different types of flower centers. You’ll see how you can use them as a garnish, ways that you can use them as part of a meal, and how you can add them in vegetable flower arrangements. In lesson 2, Bouquets and Butterflies, you’ll be making make two different fruit flower bouquets and 2 types of butterflies. Lesson 3 will show you how to make a cute bunny fruit basket and lovely calla lilies. These simple projects are great for Easter and other spring time celebrations. They always get great reactions. My son who doesn’t eat much fruit ate almost this whole bowl by himself! In lesson 4 you will learn to carve 5 variations of beautiful and intricate looking flowers from yams and turnips. You’ll also carve 4 different cucumber leaves and you’ll arrange them into a lovely bouquet. When I made these Yam flowers for the first time, I brought them to Thanksgiving dinner and my husband’s family was blown away. I’ll let you in on a little secret …. these are way easier than they look! In week 5, you will make this impressive Watermelon Flower. It’s a really easy way to get started carving watermelons that are dramatic and beautiful. Once you know how, these are pretty fast to make, too. Watermelon flowers are a great way to dress up a buffet table. Lesson 6 is Fun with Peppers where you will learn how to carve decorative bell pepper containers, tropical palm trees, 2 types of colorful whimsical flowers, and 2 types of anthuriums. You’ll also see how to easily make lovely and easy flowers from hot chili peppers. In lesson 7, you will make many types of pretty and inexpensive radish flowers, two style of bouquets using 2 several different vegetable greens and 6 types of stems made from different vegetables. In week 8, you’ll learn how to make pretty spray flowers and fanciful stems using onions and leeks. Leek flowers are great to add to platters as garnishes. And, because they are fast and easy to make, they make great filler flowers for large carving fruit centerpieces. You’ll often see these adding fill and drama to arrangements at vegetable and fruit carving competitions. Lesson 9 will teach you how to make a simple and lovely vegetable crudite bouquet for those times that you want to present something special but don’t want to take the time to carve. You’ll also learn how to make 3 types of pretty and edible jicama flowersto add to the bouquets for the times that you do want to carve. The skills learned here will come in handy for when you begin to carve melons. All of the carving techniques that you learn can be mixed and matched to make all kinds of lovely vegetable and fruit arrangements and baskets that are great to give as gifts. Imagine bringing these to your next potluck. It’s sure to get attention and compliments. 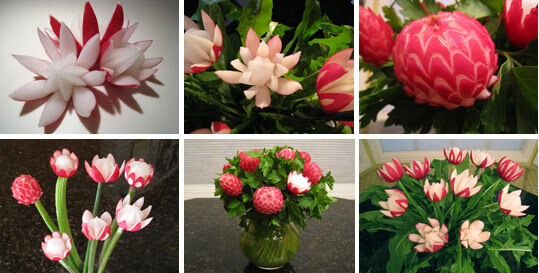 Lesson 10 will show you how to make these lovely honeydew lotuses. In the center you can place melon balls or you can carve a flower center. You will learn how in this video and you’ll learn how to dye your flower center. Lesson 11 will introduce you to carving watermelons. I’ll be showing you how to carve roses, buds and leaves into watermelons and honeydew. You will also learn how to carve multiple roses into one melon. The same designs can be carved into cantaloupe, mangoes and papayas. Long before you are finished with the course you will be the recipient of compliments and awe. Guaranteed. You’ll find that you’ll have the admiration of your friends, family and guests. Books that were once incomprehensible will begin to make more sense to you and be more useful. Best of all, you’ll experience the rewarding feeling of satisfaction from expressing your creativity with beautiful results. You’ll be proud to display your works of food art. You will have taken your food presentation to the next level. Being shown exactly how to carve is the best way to learn. Especially when you also get clear verbal instructions, too. Studies show that we learn best when we see, and hear and do. You can carve along with me as I teach you. I’ll show you common mistakes to avoid and how to fix them. Live classes can cost far more for the equivalent instructions found in my lessons….that is, IF you can find a decent instructor in your area. A good instructor can cost $350 to $750 for a single lesson! You’ll save the time and expense and inconvenience of travel to go to live lessons. The the cost of a flight or gas and lodging can add up fast. Besides eliminating the cost and inconvenience of travel, my video lesson have valuable advantages over live lessons. My lessons cover 11 weeks of learning. And learning fruit carving is most effective with time and practice. Not trying to learn everything all at once. With my lessons, you can learn at your own pace and have the advantage of being able to go back and review them whenever you like. “Never believed a DVD could be so powerful. I felt like you were in front of me in my own kitchen”. “The video lessons are really great. My daughter bought a set for me when I visited her in the US and from the moment I opened one video, I got hooked and I haven’t stopped carving since. The instructions are clear and interesting and fun to learn”. You get close up, detailed views, which you cannot always get in a classroom setting because you can’t see well over the shoulders of your classmates. When you miss what is taught in a live class, because you can’t see well or someone talks so that you can’t hear what was said, that’s it. You’ve missed it. With my video lessons you won’t miss a thing. You can always play back sections that you want to review. “That’s why I like your lessons better. I don’t miss anything and I can play them over if I do. Another great advantage over live lessons is that you can always watch your lessons any time in the future to refresh your memory. Long ago, I attended a garnishing class offered at a local cooking store. It was $75 and was a 90 minute demonstration only. We did not get to carve along with the lesson. The teacher sent us home with a written hand out and that was it. Later when I went to practice, the handout was woefully inadequate. I found myself wishing that I could see her demonstrate it again. With what I remembered, it ended up costing me $75 to learn to make an blooming onion flower like the ones fried and served in some restaurants. Not a very good value in my opinion. Another huge advantage of my video lessons is that you can learn at your own pace, in your own kitchen, at whatever time you like without having to spent the time and money to travel to a class. And you’ll get detailed step-by-step easy-to-follow instructions so that your carvings will be a success. It’s really about making it easy and convenient for you to have carving success. Now, you may be wondering, How Much? It took me many months to make these videos and have them available to you so I really should charge more. But, I want to offer a really great value. Right now, I am offering the entire 11 week online video course for $149.00. With 11 weeks of lessons, that is only $13.54 per class. I think that is a super value for you. You can get started learning right away. When you join, you will gain instant access to your video lessons. On the membership site, you will also get a quick print shopping list for each lesson making it really easy for to get started each week. You’ll know the quantity of produce that you will need and what to look for when selecting your fruits and vegetables for each project. In some of the online lessons, I’ll provide links to recipes that you can make with your carvings and the leftover scraps. On the membership site, you can make comments and see what other students are saying. I’ll be checking the comments from time to time and will answer some of the questions as my time permits. I may not be answering every question, because I’ll be busy making new lessons for the next level of classes. i have been finding it hard to find carving help and tools, i have wasted much cash and time buying books that don’t help much and buying tools that don’t really do the job. Then i stumbled on your site and took a look at one of your free lessons, i was skeptical at first, thinking that this was just another money making site out to get your cash, but the more i watched the more i realised this was not the case. Your advice is fantastic, its at the perfect pace….Your videos have saved me so much learning time and my skills have increased so much i could just give you a big hug to say thanks. all the products you recommend do the job, and one good thing is you tell us the reasons why you recommend them. if i had found your tools first i would have saved hundreds of pounds. So once again Nita a big thank you and keep those lessons coming. testimonial to your fantastic work. And by the way, there is no expiration date for the online membership. So you can go back and watch again and again. When you get started now, I will give you the first month my upcoming video of the month club FREE! This will begin at the end of the 11 week course. The lessons in my video of the month class will pick up where this class leaves off and will teach intermediate lessons with plenty of Thai style watermelon carvings. When you join now, you will get the first video in the video of the month club, free! Go ahead and get started. You will be hearing ooohhs and aaaahhs soon. If you want to see what others have said about my video lessons take a click on the “What People are Saying” link below to see emails that I have received from my happy student/customers. I Look forward to “seeing” you in the lessons.